When the news hit, Google panicked and began limiting rehab-related ads until the search engine giant snuffed the ads out completely in January 2018. After sustained radio silence on the issue, Google promised last month they would loosen January’s addiction treatment ban. Google is now forcing would-be addiction treatment advertisers to undergo the same grueling third-party certification process that it requires of advertisers in the telemedicine and pharmaceutical sector. It ain’t fast, it ain’t easy and it ain’t cheap. 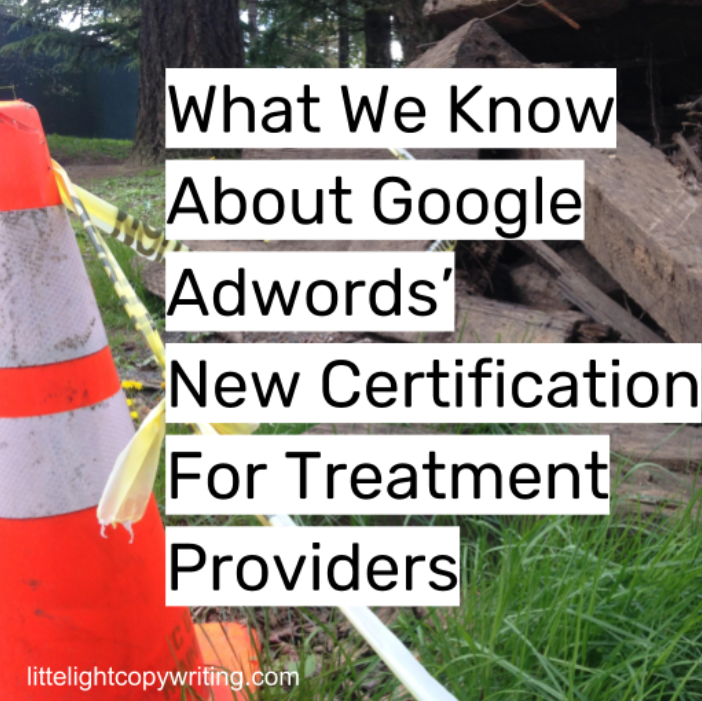 In the long run, I believe the Adwords certification will be good for the industry. More about that in a moment. The price tag? $989 to apply and $1989 to keep the certification every year. The process? Well, that’s more complicated. You can cruise over to Legitscript, the third-party certifier Google tapped for the job, and read the landing page for the program and the certification standards in full, or you can read on for my summary below. Either way, you’d better believe that Legitscript is going to require a whole bunch of legit-ness from applicants. Phew. This is no small application. Who are these Legitscript people? Legitscript is based in my hometown, Portland, OR. They currently vet Google’s telemedicine and pharmaceutical advertisers. Per John Horton’s statement on the site, Legitscript wants to “start slow” and only certify about 20-30 hand-picked providers to start. Apparently, the vetting process will be supported by a panel of experts from Partnership for Drug-Free Kids, the National Association of Addiction Treatment Providers (NAATP), and the National Center on Addiction and Substance Abuse (CASA). Looks like Legitscript wants to run a beta test on the process before launching the program in full-force. Probably a good idea. Although providers can now apply to be among the first 20-30 advertisers in the beta test, it's unclear if Legitscript will be taking applications on a first come, first serve basis. In other words, you could rush over and apply now for the certification but there's no guarantee you’ll get in for the first round. Once vetting with Legitscript is complete, applicants also need to be certified with Google—that second certification is free, but double-certification seems like overkill. Google says certified ads won’t run until July 2018. What don’t we know? A lot. Before The Verge article blew everything up, anything having to do with “addiction treatment” or “drug rehab” or “addiction recovery” was super expensive. Will that change now that the certification program is in place? Will the smaller pool of competition for keywords mean that the price per click goes down? Hard to say. When will the beta test will be expanded to include more than 20-30 applicants? Exactly how long does the certification process take? Will the certification process change and evolve as Legitscript and company explore this rabbit hole they’ve opened? Why the ban on international providers? Will the certification be expanded to include international providers? When? Under what conditions are providers required to have an on-site medical provider in order to run Google ads? Will residential programs ever get the right to advertise on Google? What does their certification process look like? Legitscript and Google aren’t providing many answers—yet. For big players, the $3,000 startup cost for a Google Adwords campaign will likely be a drop in the bucket. Sure, there are plenty of other costs that go along with running a successful PPC (Pay Per Click) campaign, but the big players were already absorbing those costs no problem. Google’s new rules are like a pin prick to the goliaths of the treatment world. My concern here is for small startup treatment providers. Google has effectively created another barrier to entry for small players into an industry in desperate need of “new blood.” That’s not great. For smaller providers, Facebook ads are a better bet. Facebook’s got no certification costs and the ads themselves are cheaper, too. Actually, they’re a lot cheaper—Facebook ads usually represent a whopping 88% savings click-for-click against Google ads. Just saying - you’ve got options. I know Google’s decisions will affect many in the industry but I believe Google made the right call here in the long term. Because I saw the suffering and it wasn’t pretty. As a Drug and Alcohol Counselor, I saw the damage from an unregulated ad market and it was heartbreaking. I encountered patients whose experience with fraudulent advertising left them with a mistrust for all addiction treatment professionals. These patients knew about the patient brokering and the bounty hunting going on outside meetings not from reading The Verge, but because they experienced it first hand. Many of them were “treatment veterans,” in and out of treatment many times. They had stories about dealing with withdrawal and navigating unethical recruitment, confusing sales pitches and insurance-first admissions calls all at the same time. The damage that these bad actors did on the internet and on the phone made my job harder. These negative experiences heightened my patients’ skepticism and mistrust. It made some of my patients lose all faith in anyone who claimed that they could “help” them. Beating addiction is already tough enough. Making it harder is just wrong. Google made a tough decision with some negative consequences, but if we want addiction treatment to be respected as the medicine it is, we need to start playing by the same rules as other medical providers. While it’s discouraging that anyone would create a fraudulent or scammy addiction treatment business, further victimizing those fighting addiction, it’s encouraging that companies like Google are willing to lead the way in supporting programs and standards to address the problem. We’re honored to be part of the solution. It’s my hope that these new rules will weed out bad actors so that the folks who are doing truly inspirational work—the people who are a part of the solution—can shine through. We need to eliminate all barriers to building trust between legit treatment providers and those seeking recovery. After all, that’s what effective marketing should do. Google’s new rules are a first step in that direction. In the long run, I think this will be good for the industry. It will be good for our patients, too.